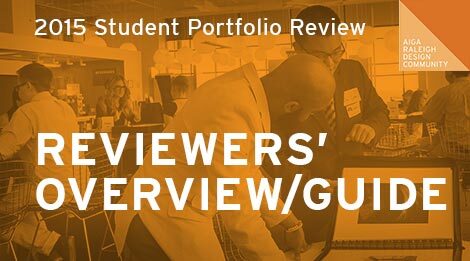 AIGA Raleigh is happy to announce that the 2015 AIGA Raleigh Student Portfolio Review is scheduled to be held on Saturday, March 28th at Red Hat in downtown Raleigh (100 E. Davie Street). As a participant, each student will receive a constructive, one-on-one evaluation of their work from a variety of design professionals located in the Triangle area. Reviewers please arrive promptly at 11 am on the 9th floor of Red Hat. You will receive your personalized Review schedule at that time. After you receive your schedule, you will be able to network with fellow professionals and enjoy refreshments. Following networking, each reviewer will provide a one-on-one evaluation (approx. 25 minutes each) with four individual students. Lastly, the Directors of the event will pose questions that recap design expectations and characteristics of a junior designer. Parking is available near Red Hat in two parking decks: Blount St. Deck, and City Center Deck. There is also parking in the City Market Parking Lot. For parking deck/lot addresses, pricing, and more information, please visit their respective sites. It may be tough, at times, to provide constructive criticism. However, please know that each student has devoted a lengthy amount of time into developing their work. Keeping respect at the forefront, be honest about your thoughts — being the “nice guy” doesn’t allow room for growth. It’s important for you to feel comfortable being truthful while allowing each designer to understand why a certain element is not working. Be tactful. Be respectful. Be honest. Providing feedback via the “hamburger method” is a framework that establishes an environment of support, not one of personal attack. This also helps reduce anxiety that students may have while presenting their work. Here is how it’s done: when viewing each piece, begin with the positive. What works? What makes it effective? Why does it work? Then, provide constructive criticism and feedback. What isn’t working? What could be done differently? Why? Lastly, end on a positive note. The student/designer should leave feeling motivated to push through additional revisions of their work. More often than not, we have a tendency to use phrases such as, “That’s super cool” or “I like that idea.” These words and phrases aren’t specific enough to provide answers on what elements may or may not be working in a design. Dig deeper and be descriptive about your thoughts — “Have you thought about increasing the type size of the headline? This may assist with the lack of hierarchy” or “I’m unsure about the use of orange – perhaps maroon or red would evoke a better sense of energy and confidence.” When delivering your feedback, remember that the more detailed you are, the better. It’s important to understand the process and approach the student/designer was taking, as well as the context of the project – inquire about each of them. This allows your feedback and insight to increase its relevance and meaning. Talk through each of these areas with one another, and the Review will immediately turn into a helpful discussion and platform for collaboration. In turn, the action items noted from the Review are much more direct and the results will be increasingly effective. Focusing on “why” is a fundamental component of a design critique. In the working world, designers are consistently responsible for their decisions and must be able to give reason for their approach. Asking “why” is a good rule of thumb that leads to new perspectives, and unlocks unanswered questions. “Why did you choose the orange over the red or maroon?” or “Why did you feel that type size was appropriate for the headline?” Posing these questions opens up the door of communication from both perspectives. Asking “why” does two things – allows the student/designer to roadmap their decision process as well as providing the reviewer with a better understanding of the design. While your suggestions may not be the absolute answer to the problem, offer feedback that is action specific yet includes a variety of possible solutions. “Orange is not working as red evokes a stronger sense of energy and confidence. However, red may not be the definite answer. That’s only one idea. What about maroon?” This allows the student/designer to ultimately be responsible for making their own decisions and choosing the route that leads the design to success. What is your initial impression of the design? Is all content present? If not, what is missing? What is the overall aesthetic effect? Does it feel appropriate for the target audience? What emotions does it evoke? Does the style of the design directly align with the goal or purpose? Are their brand standards that should be used? Are they used appropriately? Do the elements in the layout seem to be in an appropriate location? Does the content flow in a natural order and progression? How does your eye flow across the piece? Is the solution easy to use and interact with? Are typographic choices relevant and fitting in tone? Are color choices suitable for the desired message? In what way would the target audience respond to this solution? Are the details in the graphic elements tailored to the purpose of the project? What problem areas are present? What holes need to be filled as they could be more effective? Is it visually appealing for the context that it will live in? If you have questions about the Student Portfolio Review, please visit AIGA Raleigh Student Portfolio Review or feel free to contact one of the following: Director of Design Ability, Kristin Fowler, or the Co-Directors for Student Programming, Sophia Hitchcock and Jacqueline McAdams. ← National Bulletin: ARE THERE ANY GOOD “REAL” ONLINE CLASSES FOR UX DESIGNERS?